Local cuisine is without a doubt one of the pleasures of travelling. Israel has an incredibly diverse culture and it's cuisine reflects this. 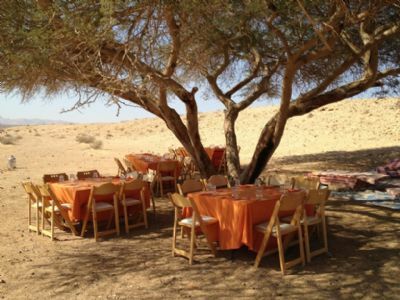 The Negev to has it's culinary pleasures as well as simple places where one can get a simple but good meal - here are some of the options and if you want a little more help or a special idea just contact us here. Imagine driving along in the desert and then suddenly coming upon a nice shady spot with a beautifully laid table and a buffet loaded with freshly prepared salads and perfectly grilled meats or a selection of local goats cheeses, salads and fine local wine. Another option would be to stop our jeeps, "in the middle of nowhere", on a dark night and then start to walk through the dark and then suddenly have lights come on illuminating a fantastic backdrop of coloured layers of rock and then a little further on a sumptuous buffet loaded with fresh salads, perfectly grilled meats all to be eaten around tables taken straight out of a restaurant complete with table cloths and fine cutlery. Our wilderness BBQs are legendary and never fail to impress our guests. We use only the finest produce and prepare it with precision to produce an unforgettable and mouth watering experience​. A typical BBQ menu includes two freshly baked Aubergine salads, a Kinoa Tabbouleh, freshly chopped vegetable salad, finely chopped cabbage dressed in soya, oil and vinegar and topped with roasted pine nuts, Humus and Techini. The meats include Chorissos sausages, chicken steaks, Kebab and perfectly cured and grilled Rib-eye steak seasoned with rock salt and coarsely ground black pepper. There are potatoes baked in and African Poyke pot and seasoned with olive oil and Rosmerine and hot Pita bread. Cold beer, local wine, cold lemonade and water wash it all down. Desert is seasonal fruit, freshly brewed herbal tea and black coffee. We also specialise in camp fire cooking and use the African Poyke pot to produce exquisite stews that are slowly cooked over the camp fire coals. 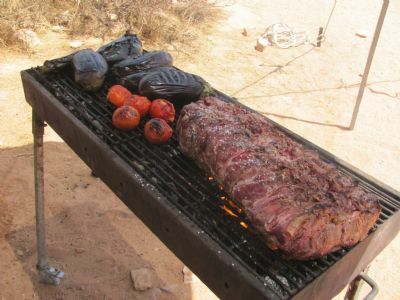 Most of our camping safaris include a Poyke stew or two and some groups come especially for the meal while others add to their experience and join us in preparing the meal themselves. In Mdreshet Ben Gurion there is the "Knaaniya" - a quaint delicatessen where they sell good wines, a huge selection of imported and local beers, cold cuts and cheeses and also prepare great sandwiches and coffee. Open Monday through to Friday with differing hours according to the season. Just next door to the "knaaniya" is the local pub, "Jumas'", where one can get pub style food including hamburgers and fries, pizza and stuff like Nachos. Open Monday to Saturday from 19.00 (Fridays from 22.00) until the last man standing and on Sunday, Tuesday, Thursday and Friday they serve freshly prepared Humus from 11.00 until 14.00. In the same place is a "Domino's Pizza" outlet which is open from Sunday to Friday from around midday until after dark - closing hours vary. Just up the road near the ancient ruins of Avdat is a "Paz" gas station complete with a convenience store open 24/7, an "Aroma" coffee shop open 7 days a week but not on Friday evening, and a "McDonald's" also open 7 days a week but not on Friday evening. The very nice and quaint "Chez Eugene" Boutique hotel complete with French style cuisine, The fantastic "Beresheet Hotel" with it's dinning rooms and pool side restaurant, the "Ramon Inn" with it's renowned local cuisine and a lobby restaurant, the "Pub Havit" with pub style menu, the homely eatery "HaKatze" which serves a varying menu. For more information contact us here​.